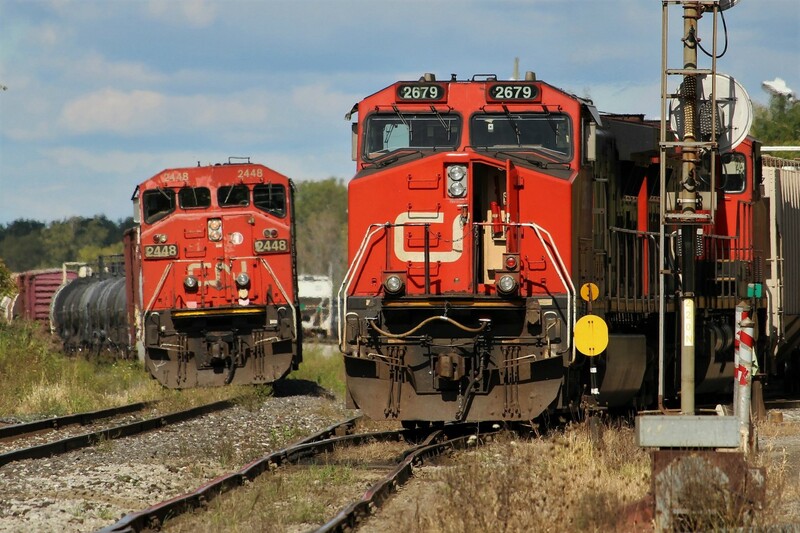 Railpictures.ca - James Knott Photo: I checked out Port Rob for the first time last month. When I got there, these three units were working together. Soon after, they split the power with 2679 and another unit being assigned to L562 and the cowl being assigned to L531 (I think? or L530?). They would sit like this while the crew took their lunch break, which allowed me to catch a southbound CP train on the Stamford Sub (Burger Road crossing) before heading back towards Brookfield to catch both of these trains on the move. | Railpictures.ca – Canadian Railway Photography – photographie ferroviaire Canadienne. Caption: I checked out Port Rob for the first time last month. When I got there, these three units were working together. Soon after, they split the power with 2679 and another unit being assigned to L562 and the cowl being assigned to L531 (I think? or L530?). They would sit like this while the crew took their lunch break, which allowed me to catch a southbound CP train on the Stamford Sub (Burger Road crossing) before heading back towards Brookfield to catch both of these trains on the move.